The first publicized discovery of a partial fossil mosasaur skull in 1764 by quarry workers in a subterranean gallery of a limestone quarry in Mount Saint Peter, near the Dutch city of Maastricht, preceded any major dinosaur fossil discoveries, but remained little known. However, a second find of a partial skull drew the Age of Enlightenment‘s attention to the existence of fossilized animals that were different from any known living creatures. When the specimen was discovered between 1770 and 1774, Johann Leonard Hoffmann, a surgeon and fossil collector, corresponded about it with the most influential scientists of his day, making the fossil famous. The original owner, though, was Godding, a canon of Maastricht cathedral. When the French revolutionary forces occupied Maastricht in 1794, the carefully hidden fossil was uncovered, after a reward, it is said, of 600 bottles of wine, and transported to Paris. After it had been earlier interpreted as a fish, a crocodile, and a sperm whale, the first to understand its lizard affinities was the Dutch scientist Adriaan Gilles Camper in 1799. In 1808, Georges Cuvier confirmed this conclusion, although le Grand Animal fossile de Maëstricht was not actually named Mosasaurus (‘Meuse reptile’) until 1822 and not given its full species name, Mosasaurus hoffmannii, until 1829. Several sets of mosasaur remains, that had been discovered earlier at Maastricht but were not identified as mosasaurs until the 19th century, have been on display in the Teylers Museum, Haarlem, procured from 1790. 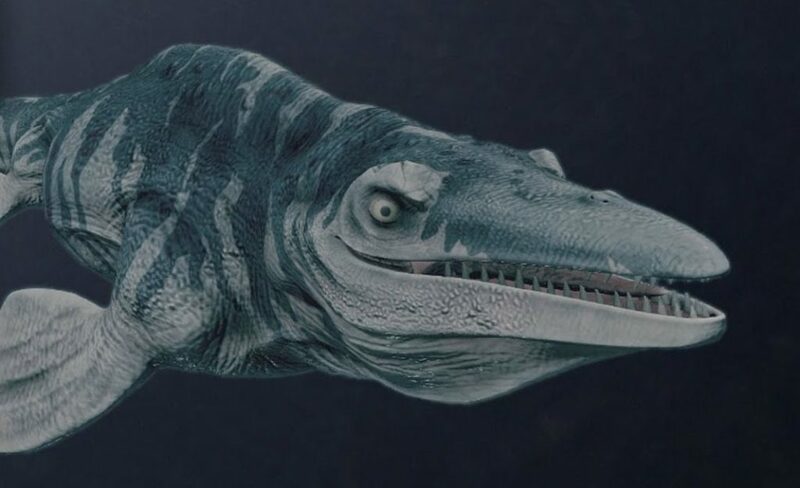 The Maastricht limestone beds were rendered so famous by the mosasaur discovery, they have given their name to the final six-million-year epoch of the Cretaceous, the Maastrichtian. Watch these next: Swim Alongside a Galápagos Marine Iguana, the ferocious predatory dinosaurs of Cretaceous Sahara, and why are there oyster shells in the ‘Chalk Pyramids’ of Kansas?